"It makes a difference to have friends who care if we hurt." For most of our problems, the solution is simple. We call our sponsor, pray, work The Steps, or go to a meeting. But what about those situations where the burden is ongoing and there's no end in sight? Most of us know what it's like to live with a painful situation - a problem that just isn't going to disappear. For some of us, the problem is an incurable, life-threatening illness. Some of us have incorrigible children. Some of us find that our earning simply don't cover our expenses. Some of us care for a chronically ill friend or family member. Those of us who have ever had to live with an unresolved problem know the relief that comes from just talking about our problem with our recovering friends. We may get some comic relief. Our friends may commiserate or cry in sympathy. Whatever they do, they ease our burden. They may not be able to solve our problem for us or take away our painful feelings, but just knowing that we are loved and cared about makes our problems bearable. We never have to be alone with our pain again. Just for today: Those problems I can't resolve can be made bearable by talking to a friend. Today, I shall call someone who cares. Place: Impian Morib Hotel, Morib, Selangor. The whole clan met last April and decided for the year 2008, our annual Family Day had to be held earlier. It seemed that almost every family will be busy with their own agenda at the end of the year. Your Honour of the family has lead the petitioned and it was accepted unanimously by the whole clan. Unfortunately for this year's Family Day, two families (The Doctor who will be needed in the operation room on the said date and The Navy whom I guess their battleship claimed more jurisdiction than us mere family) could not attend. Now there were only seven families left and not all of them were in full strength except for Yours Truly. There's only the two of us, Arah and Man the smallest contingent of gung ho participant for the Family Day. Nonetheless, we were having an enjoyable and memorable moments as usual whenever the whole clan met. Thursday - Yours Truly and the Matriarch of the family began their journey early in the morning from Sayong, Kuala Kangsar going south on the highway (accompanied aptly by the song, Highway Star by Deep Purple much to the disapproving looked by the Matriarch) heading to Batu Cave where The Corporate of the family reside. Thursday and Friday - As usual, ArahMan7 and his beloved wife will go on a shopping spree whenever they were in the vicinity of Kuala Lumpur. Their favourite haunting places were at Low Yat for computer's thingy and Central Market where ArahMan7 will spent hours looking at books (there's an Indian Muslim's bookstore where they sold second hand's books). Friday - From 1st until 3rd of August, PC Fair 2008 was being held at Kuala Lumpur Convention Center (KLCC). Thus, right after Friday's prayers, both ArahMan7 and his honey-pie was seen at the PC Fair 2008 until closing time! Saturday - (Morning) The whole families started moving out in convoy to Morib. 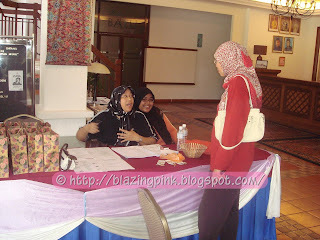 Saturday - (Noon) Registering at the front-desk headed by Your Honour. Saturday - (Afternoon) The opening game began with the youngest members of the clan. They started running to the finish line while carrying a ping pong ball on a spoon. 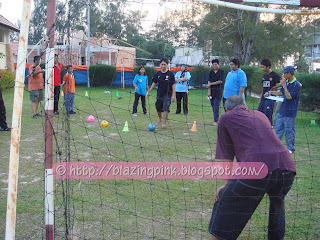 All games was organized by the courtesy of the Impian Morib Hotel's personnel. 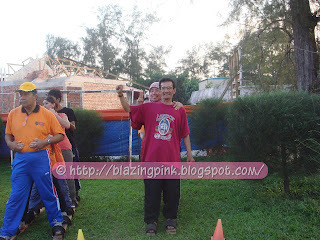 Games included were carrying ping pong's ball on a spoon for the kids, giant wooden sandal (terompah gergasi), carrying ping pong's ball with chop-stick, walking on three bricks, carrying a ball between participant's heads, penalty shoot-out and treasure hunts. Saturday - (Night) BBQ and prize giving. The Academician was unable to retain their championship this year because of the obvious reason stated above. This year's championship goes to The Corporate of Batu Cave. Despite that, ArahMan7 still managed to win two games, walking with the giant wooden sandal and treasure hunt. Both games The ArahMan7's were joined by The Attache. Sunday - (Morning) Water-polo played by the whole families at the Hotel's swimming pool. Sunday - (Noon) Check-out after lunch. Sunday - (Afternoon) Still on a shoping spree, ArahMan7 and his darling was seen at Shah Alam Civic Center attending a mobile phone's expo and getting their attires at Zara and Pierre Cardin. Sunday - (Late at night) Heading back to Batu Cave. Monday - (Afternoon) On the road again up north to Kuala Kangsar. This time accompanied by Si-Burung Bebas, a song by Lynyrd Skynyrd (I wish Mat Salo could see me impersonating Van Zant belting out Free Bird in voice-less and I could see my mother-in-law could only rolls her eyes heavenward). Your Honour attending the front desk, registration and doing the head-count with her daughter. Let's the games begun! Expertise of using a pair of chop-stick applied here. Try holding it with a ping pong ball while running to your partner and your partner doing the same thing ran back to the finish line? It ain't easy I can tell you that, but we had a great laugh seeing some participants tried to cheat. You were suppose to stop and picked up the ball on the same spot where the ball dropped. But then I guess, rules were made to be broken, huh? The much awaited, the penalty shoot-out. Ever tried kicking a balloon? That's how soft the balls were. No fancy foot-work needed. Just kicked the ball as hard as you can toward the goal hoping that the goalkeeper will get confused because the ball won't travel in a straight line! Love this game. I guess no explanations were needed here. Just let your imaginations roamed wild especially when your partner in these game were your loved ones. Fyi, ArahMan7 is still the most romantic couple for this year's Family Day, hehehe! 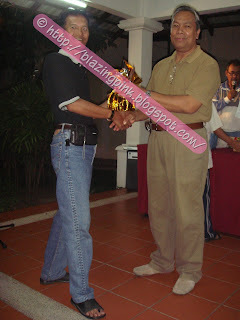 Once again, ArahMan7 was the sportsman of the year (twice in a row) receiving his prize from The Academician. After dinner and prize giving, everybody was tired. 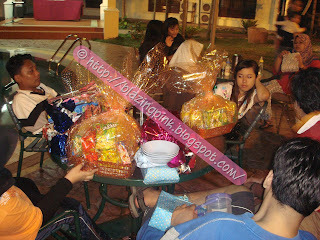 The new champ (The Corporate) team members sitting around lazily and their prizes. The most romantic couple enjoying quality times and lunch together. Gonna make it an habit, spending QT each month just the two of us. Sound great, huh? More pictures are available on Flickr, "Before And After Family Day 2008." Video will also be made available soon. No promises though (if only I can find the time to edit and publish it possibly on YouTube). Well, I guess that's it for now. I hope you enjoy this post as much as I do. 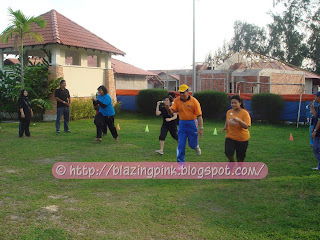 I'm sure you would like to read last year Family Day's post. Look no further, just click this link here, Family Day 2007. This is just my initial comment. I'll come back when I have the time to write a more decent response instead of this rushed one. Firstly, I'll link this post to my latest - it also has this "unresolved issues" element.It's titled The dark side of the moon Part 1. Secondly, the e-mail alert from Feedburner doesn't seem to be working. I positively remember that I've subscribed. However, I haven't received anything about your latest post. Will come again, Insyaallah. Right now things are quite hectic. Is that so? At the moment it seem things are not working alright. I didn't received any email from Blogger that you've left me a comment either. Anyway, thanks for the linky love. Really appreciate it, Bro. Greetings and lots of love from Kuale Kangsor. Salam... came here via Mat Cendana's. Another interesting blog I've just discovered. True indeed, go ahead and talk to a friend you can trust whenever there are problems you can't resolve. He/she may not be able to solve the problems for you - but hey, like you said, the problems become at least a bit more bearable. Bro, waah very interesting this clan get-together business. Can only look with envy, bro. As far as everybody in my clan is concerned, everything's torn asunder. "My baby's gone / with the wind..."
Bro, ini paternal or maternal side. Or from the better half's? remember you? you were one of my first links to sanity and sobriety!!!!! and i've missed having you around! it's simply great to hear from you again. lots of love right back at you. Kikikikikik... hah! baru lah nampak muka Cik Man kita dengan jelas when I clicked the picture of you and your other half. Dalam avatar tuh kecik sangat gambarnya! And what an awesome time spent with family. Wish I have a big family like you! hey araman, ive done it ive worked how where to press the button to post a message to you, so much has happened since we last talked, now my son lives with me, i been made redundant and reinstated again, lives going so good and i now just sit back in my boat and let god guide me through life. having a family day celebrations in school is really necessary for every student/pupil to have a family. This makes them realize how important it is to have a supporting parents. Also, that is the time to at least have a family bonding. When I was a child, I never experienced to have celebrated a family day in our school. It's really nice to have a family day at least once or twice every year. That is always going to be fun.